← First Aid Statistics – Are you prepared? Snakebite present major challenges to companies working in rural and far remote areas. Snakes are remarkable animals, successful on land (on-shore) and sea (off-shore), forest, grassland, lakes, and desert. Companies are going in search of business and natural resources to quite and far remote areas (believe me they don’t follow snakes around their facilities) but the snakes do like their company so they can find something fresh and new to eat. We are scared of them and they too are scared of us but our quest of natural resources/reserves and their to food help us to find each other most often. 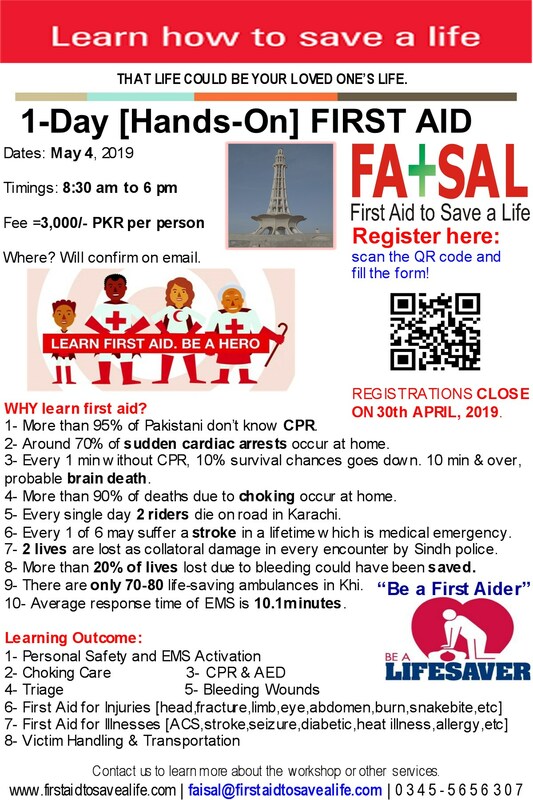 First Aid to Save a Life (FATSAL) Pakistan is a training and consultancy organization led by training experts who provides a range of training programs to help companies and communities to control workplace emergencies, administer first aid, cpr, aed and help them set up EMS Systems in place to avoid losses. FATSAL Pakistan is best option for your training needs and is the first ever training company in Pakistan offering specialized training on Snakebite Management. FATSAL is the training company who believes in the quality of education and emphasize more and more on practicals during trainings. We have training equipments and share a conducive atmosphere with our trainees to help them learn and provide them a proven “seeing, hearing, doing, speaking, feeling” approach during our trainings. We have comprehensive snakebite first aid kits for Snakebite First Aid & Management Training which gives a real hands on experience. If you have a number of delegates with similar training needs, FATSAL Pakistan also offers cost-effective in-house or on-site training solutions. This entry was posted in Advanced First Aid, emergency care and first aid, Emergency First Aid, Project Diary, Snakebite Management, Why choose First Aid to Save a Life and tagged adhasive tape, advance snakebite first aid kit, ADVANCED SNAKEBITE FIRST AID KIT, anti snake venom vials and pressure bandage, anti-septic bandages, anti-snake venom (ASV) vials, anti-snake venom vials, are snakes cold blooded, BASIC SNAKEBITE FIRST AID KIT, cardiotoxin type of snake venom, categories of snake venoms, cobera, cobra belongs to which snake family, cold-blooded snakes, control of bleeding in snakebites, cytotoxins type of snake venom, deadly snakes in sind, deadly snakes in sindh, deadly snakes of sind area, emergency medicines, fatalities from snakebites in baluchistan, fatalities from snakebites in exploration and production companies, fatalities from snakebites in gilgit baltistan, fatalities from snakebites in kashmir, fatalities from snakebites in khybar pakhtunkhawa, fatalities from snakebites in nwfp, fatalities from snakebites in oil and gas companies, fatalities from snakebites in oil and gas sector of pakistan, fatalities from snakebites in pakistan, fatalities from snakebites in punjab, fatalities from snakebites in sindh, fatalities from snakebites while at work, first aid kits, first aid to snakebite, first aid to snakebites, hematoxin type of snake venom, how many types of snake families exists, how snakes inject their venom, how snakes inject their venom when they bite, how to care snakebite case, how to manage cadiotoxin type snakebite, how to manage cytotoxin type snakebite, how to manage hematoxin type snakebite, how to manage neurotoxic snakebites, how to treat snakebites at remote locations, krait, krait belongs to which snake family, loundy snake, lundy, national institute of health, national institute of health pakistan, national institute of health pakistan and ASV, neurotoxic snakebite management kit, neurotoxin type of snake venom, pain relieving swabs, poisonous snakes, portable BP apparatus, pressure bandage and application of ANV, pressure bandages, pressure bandages and snakebite, resuscitation device, russel viper, russel viper belongs to which snake family, sari south block and types of snakes, saw scaled viper belongs to which snake family, snake safety trainings, snakebite, snakebite and use of anti venom vials, snakebite and use of tourniquit, snakebite cure, snakebite first aid kit for emergency responders, snakebite first aid kit for EMT, snakebite first aid kit for medical practitioners, snakebite first aid kits, snakebite management, snakebite management at far locations, snakebite management at remote working locations, snakebite management kit, snakebite management protocol trainings, snakebite management training, snakebite management training in baluchistan, snakebite management training in hyderabad, snakebite management training in islamabad, snakebite management training in karachi, snakebite management training in khybar pakhtunkahawa, snakebite management training in lahore, snakebite management training in punjab, snakebite management training in sind, snakebite management training in sukkur, snakebite management trainings, snakebite safety trainings, snakebite training in hyderabad, snakebite training in islamabad, snakebite training in lahore, snakebite training in pakistan, snakebite training in peshawar, snakebite training in queta, snakebite training in rawalpindi, snakebites and control of bleeding, snakebites and first aid, snakebites and its first aid, species of poisonous snakes, species of poisonous snakes in balouchistan, species of poisonous snakes in gilgit baltistan, species of poisonous snakes in jamshoroo, species of poisonous snakes in karachi, species of poisonous snakes in kashimir, species of poisonous snakes in khybar pakhtunkhawa, species of poisonous snakes in nwfp, species of poisonous snakes in pakistan, species of poisonous snakes in pakistani deserts, species of poisonous snakes in punjab, species of poisonous snakes in sindh, splints, The Extractor, The Extractor by Swayer, The Extractor venom suction device, tourniquit and snakebite, types of poisonous snakes in pakistan, types of snakes in jamshoroo, types of snakes in karachi, types of snakes in sindh, what is first aid for snakebite, what is first aid for snakebite case, what is first aid for venomous snakes, what is the first aid for poisonous snakes. Bookmark the permalink.